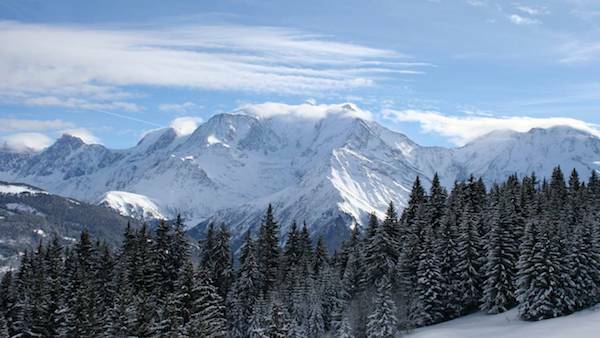 Megeve makes a great ski destination as it’s just over an hour’s drive from Geneva – perfect for a weekend of skiing. It also helps that it is one of the prettiest mountain villages in the French Alps. While Megève doesn’t have any true ski in/ski out hotels, it does have excellent skiing alongside wonderful restaurants, shopping and world-class hotels. 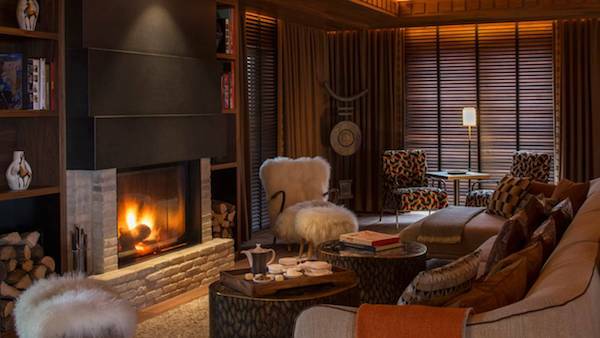 Four Seasons Megeve sits in a secluded spot on the Mont d’Arbois side of Megeve – take the 10 minute car transfer to the centre of the village or maybe take a private horse-drawn sleigh instead? From the outside, the connecting chalets look classically Alpine, but it’s a very different story inside. This is an intricately designed hotel with a modern, sleek look with statement pieces of art all around. The use of dark wood and the large fire place in the lobby gives just enough of that Alpine feel. Service at the hotel is as good as you’d expect from the Four Seasons brand: slick, attentive and the right mix of friendly and efficient. 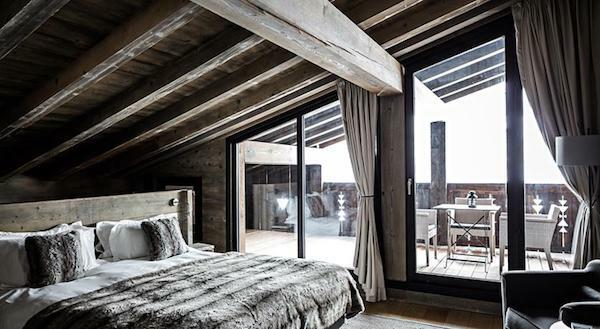 There are 55 rooms and suites where the design is modern, sleek, comfortable and luxurious – the floor to ceiling windows to the balcony gives all the sense of place you need with snow-capped chalets and the mountains in full view. Suites also have their own fire place, which adds a special touch. Dining at the hotel is impressive: The hotel’s signature restaurant, Le 1920, has two Michelin stars; Japanese fusion restaurant Kaito caters to the international jetset and the bar menu has all the classics if you want a casual dinner after a tough day on the slopes. Just don’t wince at the 47 euro club sandwich. 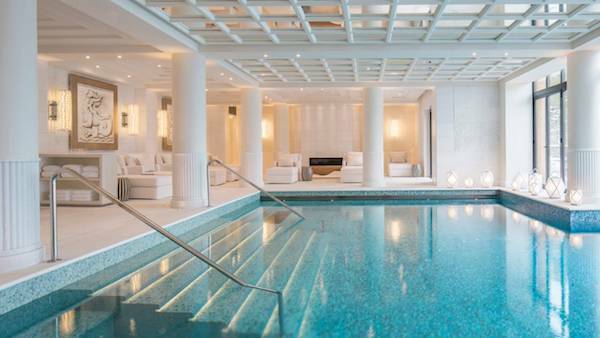 The Art Deco designed spa is a stunner – almost entirely in white with large columns giving a Roman feel in both grandness and design. 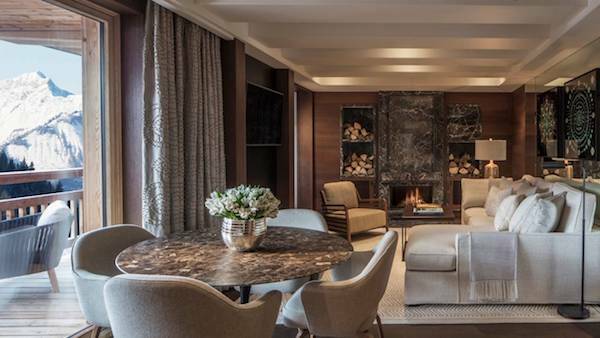 Four Seasons Megeve offers a very different take on the classic Megeve hotel and it will certainly help put the destination on the map outside of France. Below is a picture I took of the pool – you can see more on my Instagram page here. 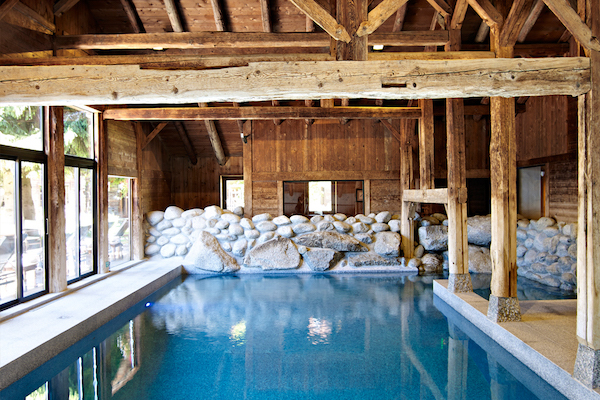 Les Fermes de Marie is a classic Alpine hotel, designed in a typical Haute-Savoie style. 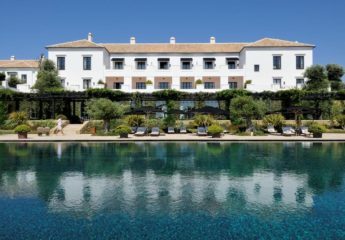 It’s a collection of traditional farmhouses restored and converted into a luxury hotel with 70 rooms and suites. The style is charming and rustic, with its use of reclaimed wood, shabby-chic furniture and cabin-style rooms. 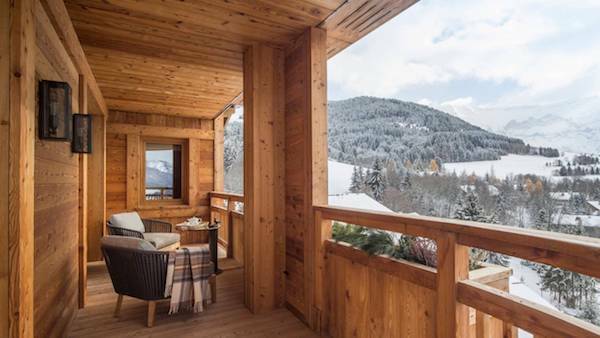 The Rochebrune chalet is a great option for families wanting a little more space and privacy, featuring a lounge with fireplace, small bedroom with two beds and a bathroom with shower and bath on the ground floor. 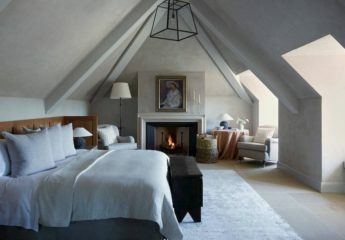 The master bedroom is on the first floor, with a small dressing and separate loo. Service is friendly, natural and unobtrusive with a sense of staying in a private home rather than a full-service hotel. The Pure Altitude spa (the hotel group’s own brand of products) is the highlight of the hotel – 10,000 sq ft featuring two pools, a gym, hot and cold soaking tubs, an outdoor hot tub and 17 treatment rooms. There’s a beautiful, cosy library area where you can enjoy an aperitif before heading to dinner at one of the restaurants. ‘Restaurant Traditionnel’ located right in the middle of the hotel is the more elegant, formal restaurant, while restaurant Alpin offers a menu of fondue and raclette among other Savoyard delights. 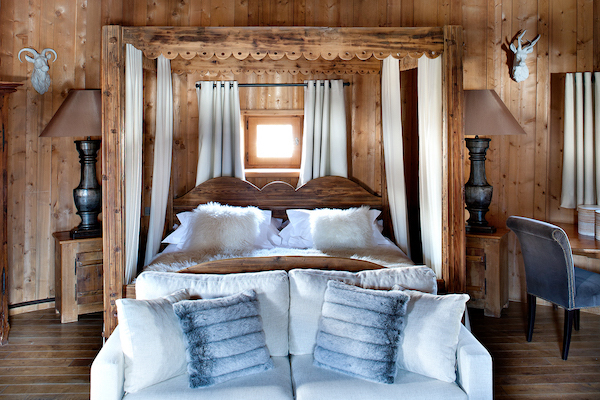 Les Fermes de Marie is ideal for those who want the comforts of a cosy, charming Alpine chalet style hotel. 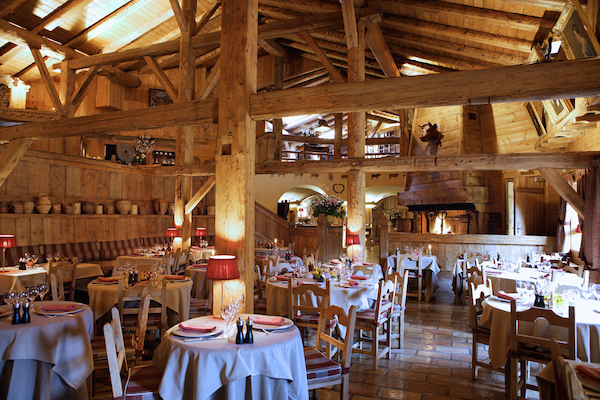 Located about a 10 minute drive outside of Megeve (or a 30 minute walk if you want to build up an appetite for lunch like we did), L’Alpaga is made up of several Alpine chalets that look rustic from the outside, but feel more like a 5 star boutique hotel inside. The joy of L’Alpaga is that it feels removed from it all and the silence and sense of relaxation is palpable. Here you feel at one with the nature around you where you can just sit and stare at the area’s beauty. The terrace, with its fire pits and faux-fur covered chairs, was absolutely delightful in the mid-afternoon sunlight. A perfect spot to snooze post-lunch. L’Alpaga has 22 bedrooms, 4 apartments and 5 chalets that are ideal for families. Flocons de Sel – 3 Michelin starred gourmet restaurant. 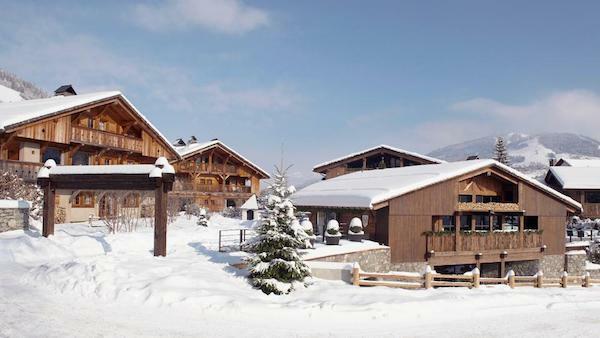 Flocons Village – Bistrot in the centre of Megeve serving simple, regional cuisine. La Taverne du Mont D’Arbois – Bistrot serving Savouyard cuisine. 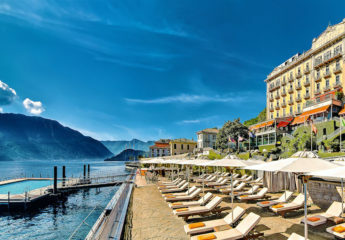 While skiing is the main attraction in the winter, there are plenty of other activities besides that and the excellent restaurants and spa time. 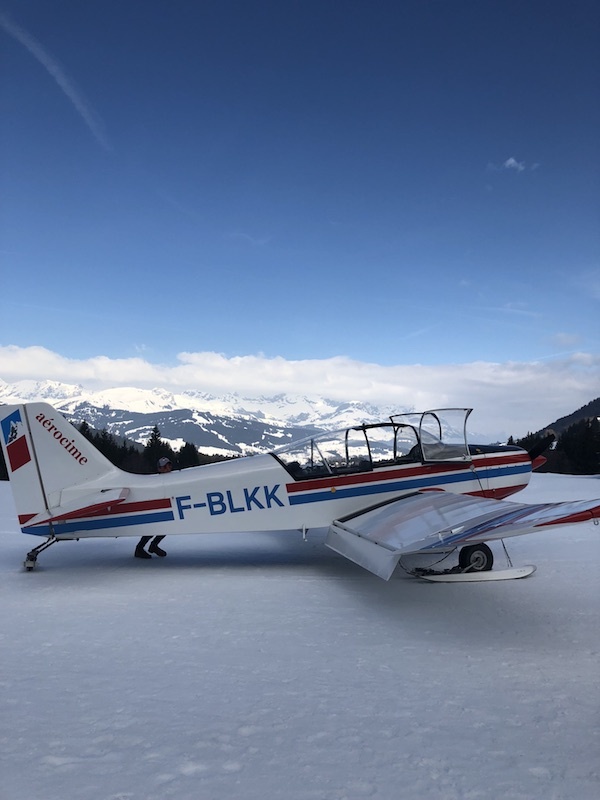 Hot air ballooning is a big attraction in Megeve, but I would highly recommend a panoramic plane ride around Mont Blanc – stunning, if a little terrifying at first! Above is a picture I took of the plane – you can see more on my Instagram page here. 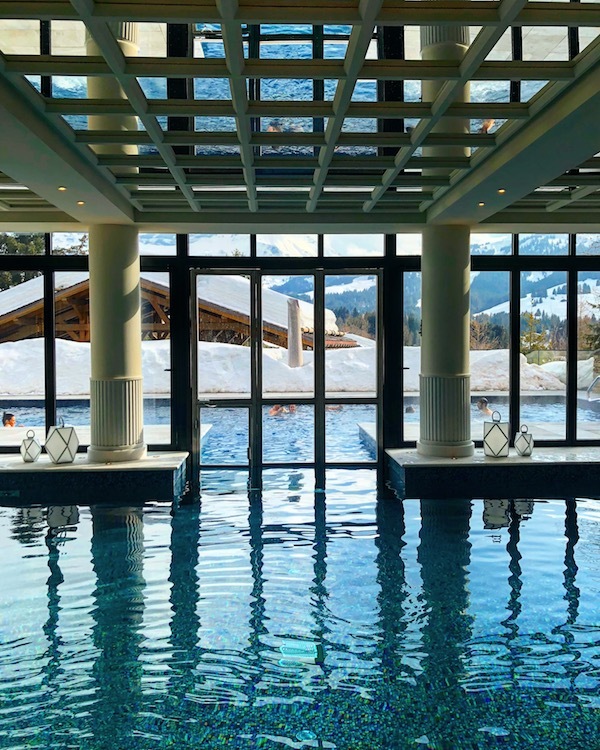 You may enjoy reading our other ski hotel reviews including The Alpina Gstaad or The Chedi Andermatt.